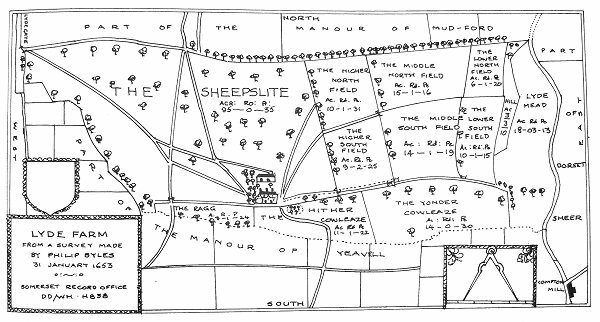 Shown as the Lower South Field on Philip Byles' map of 1653, Nine Acres originally totalled 10a 1r 15p but minor boundary changes by Victorian times had reduced its area to 8a 3r 0p. The 1846 Tithe Award noted that it was used as pasture to graze livestock. 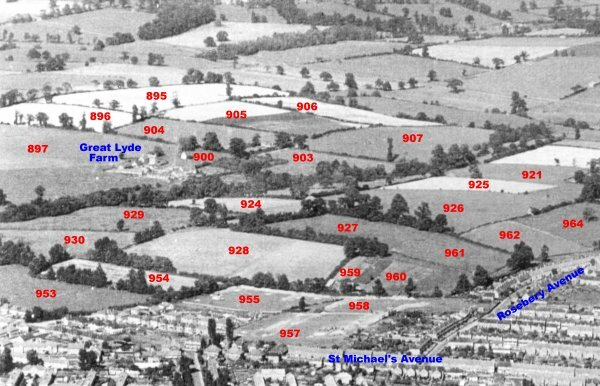 Nine Acres was bounded to the north by Twenty Acres (895), to the west by Linches (894), to the south by Lower Cowleaze (907) and to the east by Higher Cowleaze (905). Today (2014) Nine Acres is being built on as part of the ever-expanding Wyndham Park and already had Collingwood Road occupying its southern half..
Philip Byles' map of Lyde Farm dated 31 January 1653. Nine Acres is shown as the Lower South Field, to the right. A closer Google Maps image of Nine Acres at lower right clearly showing its boundary with Twenty Acres to the north and Higher Cowleaze to the west. 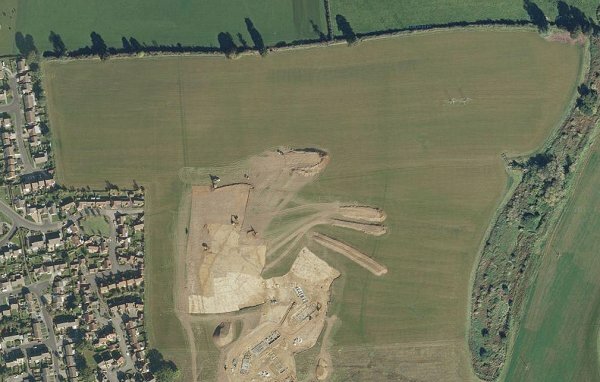 Taken during the early groundworks phase of the Wyndham Park development. It is currently (2014) being built on and already has Nelson Way occupying its southern half.